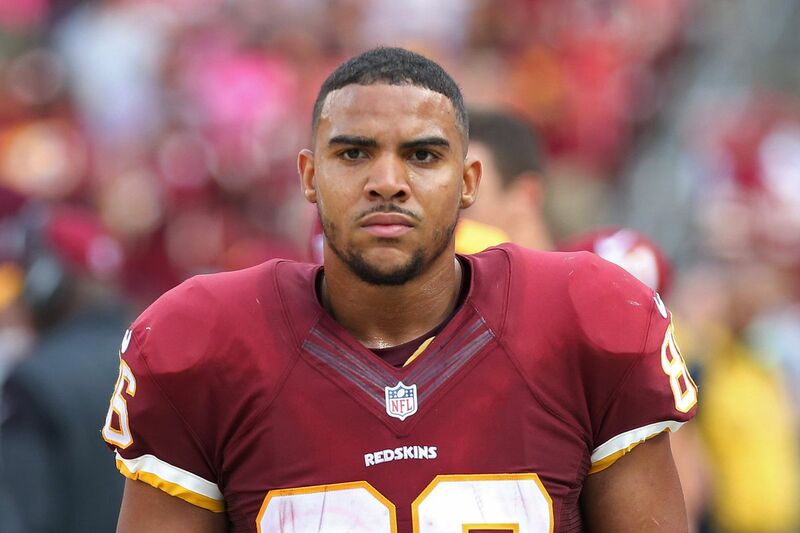 Jordan Reed - Bio, Height, Weight, What Happened To His Health? Home Sports Jordan Reed – Bio, Height, Weight, What Happened To His Health? Jordan Reed is an American footballer who plays at the tight end (TE) position for the Washington Redskins. His journey in the National Football League (NFL) began in 2013 after he was picked by the Redskins in the third round of the year’s draft. So far, his NFL career has been so impressive that some sports analysts believe he is on his way to becoming the best player in his position in the history of the league. Jordan Reed was born on July 3, 1990, in New London, Connecticut. He was raised in his birth city by his parents, Karen Reed and David Lott, alongside his elder brother, David Reed. David, who is four years older than Jordan, is also a football player. Meanwhile, the young chap (Jordan) started with playing baseball while his older brother played football and was even a high school star player. The two brothers were super close as kids and always played football together. Consequently, Jordan was able to find his career path through the guidance of his older brother with whom he played for one year at the New London High School. While Jordan played as a quarterback, his brother played as a wide receiver. During Jordan Reed’s junior year in high school, he put up such an impressive performance that cannot be forgotten in a hurry. He completed 122 of 222 passes for 1,706 yards and 38 touchdowns, threw just two interceptions, and also rushed for 370 yards and 8 touchdowns. In 2007, Jordan led his team to an undefeated regular season and in 2008, he was among the finalists for the Joe Montana High School Quarterback of the Year award. According to a rating by Rivals.com, the very enthusiastic player was a four-star recruit and the 10th best dual-threat quarterback in America. Following his high school graduation, Jordan Reed accepted a scholarship offer to attend the University of Florida where he was initially recruited to play as a quarterback for the Florida Gators from 2009 to 2012. However, after being redshirted in the 2009 season, he was moved to the tight end position the following season and he recorded a considerable amount of success for two seasons before announcing he would forgo his final season of college eligibility to enter the draft. At the end of his collegiate career, he had made 78 receptions for 938 yards and six touchdowns. During the 2013 NFL Draft, Jordan Reed was selected by the Washington Redskins in the third round, with the 85th overall pick and officially agreed to the conditions of a four-year rookie contract with the team on May 24, 2013. On September 15, 2013, he announced his entrance into the league by setting a record of being the first Redskins rookie to score a touchdown in the first two games of his career since Chris Cooley in 2004. Jordan played in the game against the Chicago Bears on October 20, 2013, and recorded 9 receptions for 134 yards and a touchdown. With this, he created a new Redskins franchise record for receiving yards by a rookie tight end and also recorded his first 100-plus yard game. Although his 2013 season was brought to an abrupt end due to a concussion, his performances in the nine games he played earned him a spot on Pro Football Weekly/Pro Football Writers of America all-rookie team. In 2014, Jordan Reed continued to show growth even though he was injured on two occasions and could not play for some weeks in the season. In the 2015 season, Reed played with an increased passion. He recorded three 100-plus yards and made a career-high 11 passes for 72 yards and a career-high two touchdowns against the Tampa Bay Buccaneers. In 2016, the footballer was ranked 77th on the NFL Top 100 Players of the year. The Redskins, in recognition of his rare talent and tireless effort, also rewarded Jordan Reed with a five-year contract extension worth $50 million. Jordan only played six games in 2017. The year was not so good for the tight end as he was forced to miss the majority of the season due to a hamstring injury. That notwithstanding, he ranked 65th on the NFL Top 100 Players of 2017 list and was also nominated to the Pro Bowl roster for the first time. Jordan Reed has thus far, proven to be one of the Washington Redskins’ most reliable weapon. What Happened To His Health? Jordan Reed has not played up to 16 games in any of the NFL seasons between 2013 and 2017. This is as a result of injuries. On November 11, 2013, he was pulled out of the game early after suffering a concussion and consequently, he could not feature in four games due to headaches arising from the concussion. He was eventually placed on injured reserve on December 19, 2013. The following year, on September 7, 2014, he was taken out of the season-opening game due to a hamstring injury which kept him away from playing until Week 6. He was also unable to play in Week 12 because of another hamstring injury on November 16. During the game against the Dallas Cowboys on November 24, 2016, the football player suffered a Grade 3 AC joint separation in his left shoulder which kept him out of the field in Week 13. In 2017, a toe and hamstring injury limited him to a career-low six games. He treated his toes with physical therapy, an orthopedic insert in his shoes and a stem-cell injection but the soreness persisted. His big toes were then operated and the sesamoid bone in each of them was removed. According to the player, he has been free from pain since recovering from the surgery. Even though his participation has been limited, Jordan now looks like the firebrand player he is known to be on the field.